The Vikings’ premiere receiving duo capped Sunday’s fourth-quarter comeback in Green Bay by each making a spectacular play. And that wasn't all they did. Jaire Alexander didn’t have much of a chance without risking pass interference. The Packers rookie cornerback chased Vikings receiver Adam Thielen down the sideline, turning his head only when it was too late. Thielen ran an out-and-up pattern as Alexander trailed him. It was first down with 36 seconds left and the Vikings needed eight points to force a tie and overtime. To not give away the impending 22-yard touchdown catch, Thielen kept his hands low until the last possible moment — a trick of the receiver trade perfected from legends like Randy Moss to Larry Fitzgerald. Quarterback Kirk Cousins’ throw over Alexander’s shoulder, while he was drilled low by Packers defensive tackle Mike Daniels, was overshadowed only by Thielen’s finesse. The Vikings’ premiere receiving duo capped Sunday’s 29-29 tie in Green Bay with two exclamation points. Stefon Diggs’ in-and-out move on 35-year-old corner Tramon Williams produced one of the easiest goal-line fades you’ll see for the ensuing two-point conversion. 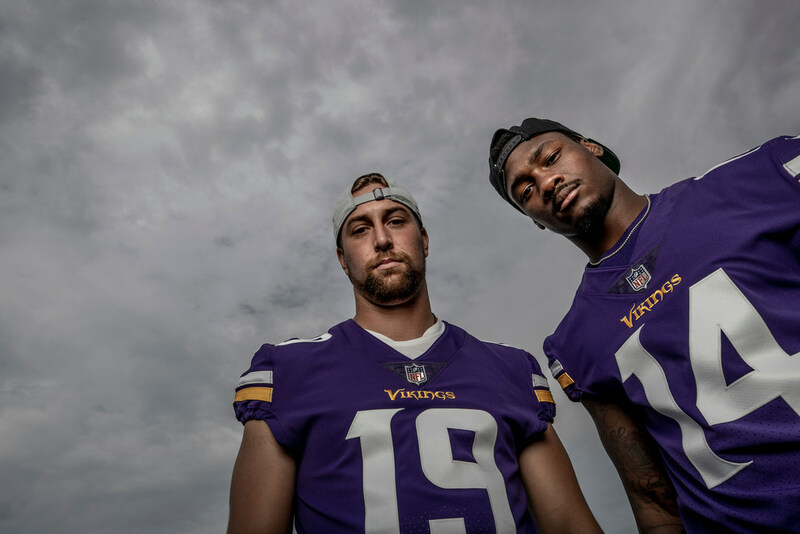 Thielen and Diggs became just the third receiving duo to each record 125 yards in a game since the start of last season, joining Tampa Bay’s Mike Evans and DeSean Jackson (Week 1, 2018) and Houston’s DeAndre Hopkins and Will Fuller (Week 7, 2017), according to Pro Football Reference. 1. The NFL’s best receiving duo? Thielen and Diggs nearly broke their own record for most combined yardage in a game after racking up 21 catches for 259 yards in Green Bay. It’s the duo’s most productive outing behind only last year’s win against Tampa Bay when they combined for 271 yards. They did it on short, intermediate and deep routes. Diggs spent much of his afternoon roasting Williams, the Packers veteran, including on an 18-yard comeback route and the two-point conversion. Diggs gets a lot of attention for fluid route running and sharp breaks that spin around defenders, but his long speed was on full display during the 75-yard touchdown. A stack release, with Diggs lined up behind Laquon Treadwell, gave him the room to get a full head of steam at Davon House, who watched Cousins’ 60-plus yard throw turn into a quick fourth-quarter touchdown. The Vikings’ depth behind their top duo was exposed in the late-game shootout. Treadwell (45 snaps) dropped three of six targets, tipping a late pass into a costly interception deep in Vikings territory. He and Cousins also weren’t on the same page on an overtime throw that sailed outward as Treadwell cut inward. So, the Vikings signed veteran burner Aldrick Robinson, who once ran a 4.43-second 40-yard dash, after the game. There’s little criticism to be levied on Cousins after he became just the fifth Vikings quarterback to ever produce a 400-yard, 4-touchdown game — the first since Daunte Culpepper in 2004. Cousins responded from his 0-for-6 fourth quarter in Week 1 by throwing for 134 yards, three touchdowns and the tipped interception in Sunday’s fourth quarter. 2. Pressure report: You’ve probably seen the stat that quarterback Aaron Rodgers was 9 for 9 throwing against Vikings blitzes. That doesn’t tell the whole story. The Vikings blitzed Rodgers on 12 of his 49 dropbacks [24.5%] and the former league MVP was successful on seven of those 12 plays. The other five blitzes ended in two Vikings sacks and three completions well short of the marker for eight yards. Overall, the Vikings sacked Rodgers four times within nine hits, led by defensive tackle Sheldon Richardson (3 hits) and defensive end Everson Griffen (2 hits). Richardson also drew a hold that negated a Jimmy Graham touchdown in the third quarter. Packers tackles David Bakhtiari and Bryan Bulaga were stiffer opponents for ends Griffen and Danielle Hunter than the week prior vs. San Francisco. They were still able to cap pressures with sacks, including Hunter breezing past Bulaga on a speed rush for his sack. Defensive end Stephen Weatherly later beat Bulaga for a hit on Rodgers. The Vikings’ offensive line continues to be its weak link. Coordinator John DeFilippo has schemed ways to help them in pass protection, including varied screens, sweeps and play-action bootlegs that heavily featured tight end Kyle Rudolph in the passing game. The overall outcome was solid considering Cousins was sacked just twice on six hits. When right tackle Rashod Hill (41 snaps) went down with an injured right ankle, rookie Brian O’Neill (32 snaps) made his debut on offense. O’Neill wasn’t beat quickly, which is a good first step. Run blocking is where the Vikings could desperately use more from their offensive line. Running back Dalvin Cook was again more of a factor in the passing game, partly because of an early deficit but also because the quick pass game has been used to supplant an inefficient run game. Only six of the Vikings’ 43 first downs through two games were gained on the ground. That’s not good. Both Hill and left tackle Riley Reiff were called for holding Packers defensive end Muhammad Wilkerson on run plays. 3. 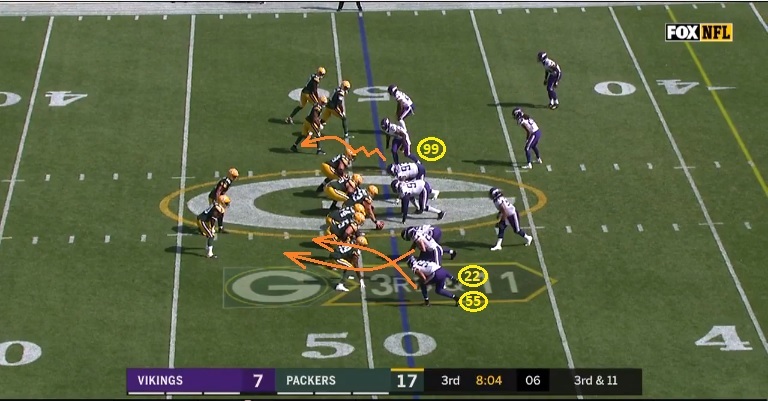 Anatomy of a play: A year ago, linebacker Anthony Barr (#55) was assigned to ‘spy’ a healthy Rodgers in some obvious passing situations. Barr was doing just that when he made the hit that broke Rodgers’ collarbone as the quarterback escaped the pocket. During Sunday’s 29-29 tie, Rodgers wasn’t full healthy or therefore very mobile playing through a sprained left knee. But Zimmer still respected Rodgers’ mobility when installing certain blitzes against the Packers. On this third-and-11 below, the Vikings bring a typical overloaded blitz that sends Barr, safety Harrison Smith (#22) and has linebacker Eric Kendricks assigned to the running back; Kendricks could seemingly add to the blitz if the back, Jamaal Williams, blocked Barr or Smith. What’s different is the backside end, Hunter (#99), staggers his rush and waits for Rodgers to react to the overloaded blitz. If Rodgers were to flee to the open side, Hunter would be there waiting — effectively a ‘spy’ assignment. Defensive end Everson Griffen did this a couple times in the game as well. This play still turns into a 31-yard pickup for the Packers, because Rodgers gets the ball out in three seconds, finds receiver Davante Adams for a 16-yard catch and safety Andrew Sendejo chips in 15 yards via an unnecessary roughness penalty. Watch below and you’ll also see Packers tight end Marcedes Lewis get away with a hold on Barr. Aside from missing three field goals, kicker Daniel Carlson whiffed on a mortar kick that landed near the Packers’ own 20-yard line and set up a fourth-quarter drive at Green Bay’s 31-yard line. The Vikings also weren’t pleased with a couple missed fair catches, leading to lost yardage on punt returns. Starting returner Marcus Sherels had left the game due to a chest injury. Receiver Stacy Coley nearly turned over a kick return when he didn’t kneel in the end zone for a touchback before flipping the ball to an official. 5. Plenty to like, and plenty to clean up in secondary: The Vikings defense should feel good with how they covered Packers targets, specifically in the red zone, and of course with some exceptions. Overall, they surrendered three 20-plus plays (half of what happened in the last full game vs. Rodgers in 2016). The Packers came away with just four field goals and a touchdown in five trips inside the Vikings’ 20-yard line as the defense allowed 22 points total. Linebacker Eric Kendricks showed why the Vikings signed him to a five-year extension this offseason. He made perhaps the most unheralded, game-saving play in the end zone at Lambeau. After Treadwell’s tipped pass into an interception set up Rodgers at the Vikings’ 13-yard line, Rodgers looked for the dagger. He found Adams for what would’ve been a touchdown and two-score lead under two minutes left, but Kendricks’ right hand ripped the ball loose as they fell to the ground. Two plays later, Mason Crosby gave the Packers an eight-point lead the Vikings would eventually tie to force overtime. Cornerback Mackensie Alexander’s return from an ankle injury was full of ups and downs to start his third NFL season. Alexander (54 snaps) had a few solid open-field tackles and an overtime sack to force a Packers punt. But the young cornerback was also the culprit on two of the Vikings’ biggest leaks to tight end Jimmy Graham. Alexander let Graham run free behind him on a 34-yard pickup down the left sideline. Then Alexander again lost Graham on a broken play that set up Crosby’s 52-yard miss before overtime. Rodgers escaped the pocket and found an open Graham, behind Alexander, for 27 yards with seven seconds left in regulation. He was also flagged for a hold on Randall Cobb that moved the chains on third-and-2 during a touchdown drive. One uncharacteristic error kept repeating as the Vikings’ back end missed at least six tackles: two by Alexander and one apiece from Trae Waynes, Mike Hughes, Jayron Kearse and Barr. Did Vikings err by drafting a kicker, or was Carlson just the wrong one?